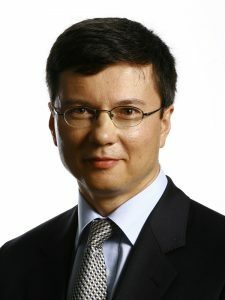 Vladimir is one of the leaders of Microsoft’s professional services arm, which helps customers to harness the power of digital technology in their business models. Vladimir started his career in management consulting, working internationally and progressing to the Partner level. During his 15 years at Braxton Associates, Mitchell Madison Group, KPMG Boxwood, BDO, he advised numerous company boards on strategy and implementing strategy-led transformations. In 2007 Vladimir joined Microsoft to run its Consulting & Support businesses in Russia, he then moved to the company’s HQ to launch the new Digital Advisory Services, and in 2014 returned to Europe to lead Microsoft Consulting Services in EMEA. Currently, Vladimir focuses on executing Microsoft’s internal transformation to best position the company for the Cloud era. Vladimir was educated at Moscow University (Soil Science), Cambridge University (Social & Political Sciences) and INSEAD (Business Administration).